PLEASE NOTE: YOU WILL BE E-MAILED LOGIN INSTRUCTIONS 48+ HOURS AFTER PURCHASE. This course covers the basics of hydrostatic transmissions, as well as valves and maintenance systems common to almost all combustion engine vehicles. Students also study the symbols and language of hydraulic schematics for a comprehensive understanding of mobile hydraulic systems. This course delivers an interactive training experience designed to help students understand the various components found in a typical hydraulic system and how these components function and interact with each other. 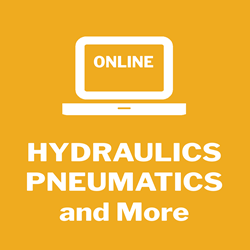 Learn about various hydraulic pumps, actuators and pressure controls. See how directional flow and modular control valves operate and produce force inside hydraulic systems. Study maintenance practices for hydraulic systems and their accessories. Understand the basic physics laws as they apply to fluid power and the symbols represented in hydraulic schematics. The learning labs, 3D simulations, quizzes, and tests presented in this course bring unmatched interactivity for a comprehensive view of hydraulic systems. Industrial Mechanical Course - delivers an interactive training experience designed to show the various components found in a typical mechanical system and how these components function and interact with each other. Learn about topics such as linear actuators, clutches, brakes, bearings, gears, drives, and more. Study how these mechanical systems work and how to troubleshoot them. This course delivers an interactive training experience designed to help trainees understand the fundamental concepts of electrical systems of mobile equipment, including the basic electrical system common to almost all combustion engine vehicles. This course focuses on the basic physics laws, schematics, and systems design associated with pneumatic systems and fluid power. The course delivers an interactive training experience designed to help students understand the various components found in a typical pneumatic system and how these components function and interact with each other. Learn about various pneumatic compressors, air dryers, actuators and airline conductors. See how air is used as a medium to transfer energy through vacuum, as well as distribution and directional controls. Study air preparation, distribution and accessories used to make pneumatic systems operate. Understand the symbols represented in pneumatic schematics and how to read them. The learning labs, 3D simulations, quizzes and tests presented in this with this course bring unmatched interactivity for a comprehensive view of pneumatic systems. This course delivers a practical training experience designed to help you understand the concepts governing electrical systems.This course is popular among individuals who need to understand the workings of electrical systems on the production floor. This course covers topics related to electrical systems: circuits, basic magnetism, circuit components and electrical testers. As part of this course, students learn the formulas, laws, and basic terminology of electricity. The learning labs, 3D animations, quizzes, and tests in this course bring unmatched interactivity and present you with a comprehensive view of electrical systems. This theory-based course is designed for electrical technicians and those seeking to become journeymen.The learning labs, 3D animations, quizzes and tests in this course bring unmatched interactivity and present you with a comprehensive view of Electrical Theory systems. This course is designed for electrical technicians and those seeking to renew their electrical master’s certification. After successfully completing this course, students will be ready to pass the test for their Industrial Training Zone Electrical Theory Certification. This course covers how to identify and calculate the speed, torque, and horsepower of a motor, how motors and drives operate, and identify the hard-working hardware and firmware involved in motor operation. This course also covers how to match system components to their respective applications and about the safety considerations associated with operating electromechanical systems. This course delivers an interactive training experience designed to help students understand the fundamentals of Diesel Engines. The learning labs, 3D simulations, quizzes, and tests presented in this with this course bring unmatched interactivity for a comprehensive view of diesel engines. Begin by learning combustion fundamentals and a brief history of diesel engines. Identify the various components of a typical diesel engine and how these components function and interact with each other. Understand fuel pumps, fuel injectors, and intake and exhaust systems, and study the components of the diesel fuel system. Learn about engine lubrication and observe how engine cooling systems work. This course delivers an interactive training experience designed to help students learn the necessary concepts to properly operate the systems and components of PLC systems. In this course, students explore the hardware, firmware, and software that make a PLC function. The course also examines appropriate PLCs to use for specific purposes, how to connect devices to a PLC, and how to read and write basic PLC ladder-logic software programs. By understanding how to connect to PLC hardware and function in various control systems, students build strong foundational knowledge of automation control and components.